Used to be there was pretty much one shoe choice for running, walking, skipping, jumping, tiddly-winking, etc. : Converse Chuck Taylor All-Stars. They weren't flashy, but they were cheap and they could handle anything a 12-year-old kid could throw at them. Times have changed. Today theres a mind-numbing variety of shoes for every possible activity. But why? Do walkers, for example, need different shoes for strolling vs. racewalking vs. hiking? Does it really matter? Well, in a word, yes. All walkers were not created equal. Just as Cinderellas slipper fit only her foot, your shoes may fit only one fitness activity. Different ways of walking require different shoe designs and materials. The lightness and flexibility of a racewalking shoe would spell disaster on a tough hike over rough terrain. For casual fitness walking, anything goes ... almost. 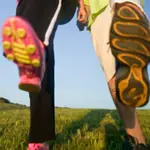 Fitness walkers—as opposed to racewalkers—who aren't planning to cover more than three to five miles at a time are safe using anything from lightweight running shoes to cross-trainers to real racewalking shoes. Walkers generally impact the ground with less than half the force of runners, so they dont need excessive cushioning. In fact, too much fluff in the heel can lead to shin pain and other problems. A good rule of big toe (as opposed to thumb) is that any comfortable running, walking or racewalking shoe that doesnt give you blisters is probably okay for casual walking. An increasingly popular fitness and competitive activity, racewalking is not just fast walking. Olympic-style racewalking uses a lot more muscles and relies on the feet much more than fitness walking does. Consequently, the right shoes are critical. Racewalking shoes need to be very flexible to allow the feet to roll from heel to toe, and they should have a very low heel to reduce leverage that can cause the feet to slap the ground after heel contact. Real racewalking shoes or running racing flats or trainer-racers are your best bets. Walking marathons—or even three-day ultra-marathons—is another form of athletic challenge that is growing in popularity. How you walk one of these events will dictate what you should wear. Most marathon walkers use everyday fitness walking technique, so walking shoes or lightweight running shoes are appropriate. But a growing number of marathons (Los Angeles, Disney, Honolulu, Portland and Mardi Gras, to name a few) include competitive racewalking categories. If you plan on racewalking a marathon, youll need a good racewalking shoe, or a stable runners racing flat as described above. Picking the right kind of shoe is important, but the fit of the shoe is the most critical factor when youre on your feet for many hours. Shoes that are too tight (or too loose) can cause painful blisters or black toenails. Hiking shoes and boots are all about disaster avoidance. (Step on an algae-covered rock in a fast-running mountain stream and youll know exactly what Im talking about!) For most hikes, anything with a treaded, high-grip outsole will do. I often wear a pair of Tevas or New Balance sandals for easy hikes, but for more rugged terrain, youll want to invest in something more substantial to prevent ankle sprains. A high-cut hiking boot is a must when hiking on rocky trails. So, there you have it. Maybe you could do anything in your Chuck Ts as a 50-pound bundle of energy, but nowadays, unless you want to contribute to your podiatrists new Mercedes, get the right shoe for the job. Fitness walking shoes and hiking boots are available in most athletic shoe stores, but racing flats and racewalking shoes can be more difficult to find. Good luck finding your perfect fit, and remember to keep walking!